In the fall 2008, I collaborated with Johnson and Nataly Gattegno of Future Cities Lab to create Vivisys, an “experimental double-curved acrylic lattice vault that plays host to an extraordinary cluster of CNC prototyped metallic barnacles. 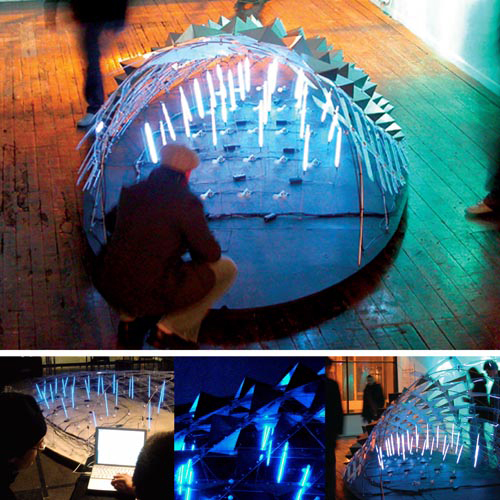 A robotic soundscape, comprised of networked auroras of electron emitting cold cathode tubes, responds to interactions from the environment.” I designed and implemented the interactive electronics and software, including cold cathode tube array, sensor network, and solenoid-driven robotic shaker instrument ensemble. The system responds and modulates its behavior in response to presence, location, and actions of visitors to the space. More information at Future Cities Lab.